The following are narrative summaries of significant sightings in 2014. For a searchable spreadsheet of all sightings in 2014, please see the Archives on the main Observations page. The L. Merritt (Oakland) Tufted Duck failed to return this winter but a male Tufted joined a scaup flock on Abbotts Lagoon, PRNS, MRN, Nov. 23-Dec. 6 (ECl; MDe) and a female Tufted graced Stafford L., MRN, on Dec. 26 (DG). Harlequin Ducks were regularly reported, usually in the company of Surf Scoters, from their preferred mussel hunting grounds around Battery Godfrey, SF (PSa), Mussel Rock in Pacifica, SM (CM; JMo), Mile Rock, SF (AH, oob), and Drakes Bay, PRNS (DG). Several lakes and salt ponds in SCL hosted birds more commonly found off the coast: a Pacific Loon Dec. 18-22 on Salt Pond A16 in Alviso (BB, CL, GZ; mob); a Common Loon Dec. 6 at Almaden Res. (DNi; mob); another Common Loon Dec. 14-16 on Salt Pond A4 at Sunnyvale WPCP (DNi, GZ; mob); a Red-necked Grebe Dec. 9-31 at Coyote L. CP (SRs, JD; mob); and a 2nd Red-necked Grebe Dec. 27-31 at Calero CP (BP, oob; BMi). On Dec. 3, a shearwater with a flight style similar to a Sooty Shearwater was noted offshore at Ballena Ave. in ALA, ALA (BR). A California Condor wandered north to the Palo Alto foothills, SCL, on Nov. 18 (DC). A Northern Goshawk in flight over Eagle Peak at Mt. Diablo SP, CC, provided diagnostic photos on Nov. 11 (DWi). On Dec. 30, 3 Sandhill Cranes circled over L. Chabot RP, ALA (RN). This winter has provided a murrelet bonanza for sea watchers. On Dec. 13, 3 Scripps’s Murrelets came into shore just past the surf line at the Pescadero Cr. mouth, SM (RTe, STe, LT). Ancient Murrelets have been reported regularly along the entire CA coast with local reports from Pigeon Pt., SM (RTh, LB; oob); Pescadero Cr. mouth, SM (AD; oob); PRNS Fish Docks, MRN (RDG; mob); and even the Berkeley Pier, ALA (SF). The most tantalizing and frustrating report was a possible Japanese Murrelet (Lymnocryptes minimus) located in the company of Ancient Murrelets Nov. 24 and 25 on Drake’s Bay from the PRNS Fish Docks (SH; EH, KH, JD). Distant photos were obtained showing field marks consistent with Japanese Murrelet. More details are available at http://blog.aba.org/2014/11/open-mic-apparent-japanese-murrelet-in-california.html. Black-legged Kittiwakes were spotted Dec. 6 from Ocean Beach, SF, and again on the 23rd from Cliff House (PSa). Two Kittiwakes visited Salmon Cr. mouth, SON, on Dec. 7 (BiM). A 1st cycle Sabine’s Gull made a Nov. 11 appearance at Pacifica Pier, SM (JTh). An adult Lesser Black-backed Gull (Larus fuscus) was ID’d Dec. 18 at New Chicago Marsh in Alviso, SCL (SRt). An adult Slaty-backed Gull (Larus schistisagus) was well described Dec. 6 from Salmon Cr. mouth, SON (TB). Unusual in any season but especially in Dec., a Black Tern was found foraging over Bolinas Lagoon, MRN, on Dec. 4 (MDe, RDG; PP). A White-winged Dove gave good looks to the bird monitors on SE Farallon Island, SF, Nov. 6-8 (MPr; mob). On Nov. 23, a White-winged Dove joined a Eurasian-collared flock on the power lines over Water Lane in Pescadero, SM (GH). A day-roosting Long-eared Owl was a surprise find on Dec. 3 at Mallard Res., CC (AL). In the pre-dawn hours of Dec. 14, an owling team for the Oakland CBC heard a Long-eared Owl call briefly from Redwood RP, CC (RLw, DQ, oob). A week later, a/the Long-eared Owl was detected from nearby Pinehurst Rd. (CS). An unseasonal Vaux’s Swift fluttered over Felt L., SCL, on Dec. 15 (PD). Late Black-chinned Hummingbirds were reported on Nov. 9 from the Oakmore neighborhood in Oakland, ALA (GT); on Dec. 16 from Coyote Cr. Trail in San Jose, SCL (AV); and on Dec. 21 in Occidental, SON (MH). A Hammond’s Flycatcher was photographed Nov. 19 around the mitigation ponds at American Cyn. Wetlands, NAP (DR, RLn; SS, BD). Lingering Pacific-slope Flycatchers were located on Nov. 8 at Tunitas Cr. mouth, SM (AO) and on Nov. 23 at Baker Beach, SF (MC). Beginning Nov. 14, the SM Eastern Phoebe returned to Stage Rd. in Pescadero for its 4th winter (RTh; CD, LK). In SF on Nov. 21, an Eastern Phoebe was harassed by a Say’s Phoebe at Yosemite Slough (RuB). A juvenile Dusky-capped Flycatcher (Myiarchus tuberculifer) that was photographed on Nov. 2 along the Bear Valley Trail in PRNS proved interesting, both for the early fall arrival date and for the evidence that it arrived in CA before completing its pre-formative molt (BoA, BA). A Scissor-tailed Flycatcher brought birders and golfers together Nov. 27-Dec. 6 on the Half Moon Bay Golf links at Miramontes Pt., SM (ECa; mob). Four Cassin’s Vireos were reported this period, with the latest report occurring Dec. 20 from Sir Francis Drake Drive near Olema Marsh, MRN (RTe). On Dec. 5, birders located and photographed not 1 but 2 Warbling Vireos calling and foraging near John Muir pond in the SF Botanical Garden, GGP (RuB, Peter Ohara). A mini Clark’s Nutcracker invasion occurred in west MRN beginning Nov. 3 when the 1st bird was discovered foraging bishop pine cones near the Bayview Trail parking lot in PRNS (CA; mob). The next day, a 2nd bird showed up in the Bolinas Mesa neighborhood, where it lingered most of the month (SH, oob). A solo Mountain Bluebird wandered to SE Farallon Island Nov. 6-7 (MPr; mob) and a flock of 7 returned to its favored wintering grounds along Patterson Pass Rd., ALA, beginning Nov. 23 (JTi; DWe). Townsend’s Solitaires returned to the junipers on Mt. Saint Helena, NAP (DM, MPa) and to the sargent cypress at Barth’s Retreat on Mt. Tamalpais, MRN (JMi; mob). 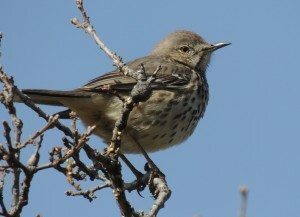 A Sage Thrasher appeared briefly at Pinole Shores, CC, Dec. 7 (LL). Up to 5 Lapland Longspurs returned to Hayward RS’s Mt. Trashmore (ALA) Nov. 17-Dec. 5 (BD; mob). A flyover Lapland Longspur was ID’d by call on Dec. 6 at American Cyn. Wetlands, NAP (MB). A Chestnut-collared Longspur flew over Battery Godfrey, SF, on Nov. 3 (PSa). A Snow Bunting (Plectrophenax nivalis) was a 1-day wonder on Nov. 19 at Tennessee Valley, MRN (JiC, fide DM). A Lucy’s Warbler was discovered Dec. 29 near Ulistac Natural Area in San Jose, SCL (AeB). Beginning Dec. 15, a Northern Parula joined a chickadee flock in the Stanford main quad, SCL (RFu, JW, SC; PD). A Blackburnian Warbler was located Dec. 21 at Half Moon Bay WTP, SM (DP; MDF). Black-throated Blue Warblers visited PRNS Fish Docks and Lighthouse on Nov. 1(JCS, ES). An overwintering Prairie Warbler lingered at Battery Godfrey, SF beginning Nov. 3 (PSa; mob). A Green-tailed Towhee joined a sparrow flock at Flatiron Marsh in Benicia, SOL, Dec. 15-26 (DR; DNu, LN). A Vesper Sparrow was photographed Dec. 6 along the East Mezue Trail in Wildcat Cyn. RP, CC (TM). The Lark Bunting at the Johnston House in Half Moon Bay was relocated Nov. 18-Dec. 18 (RTh; mob). On Dec. 20, PRNS CBC counters along the southwestern shore of outer Abbott’s Lagoon located a skulking pumpkin-faced sparrow that turned out to be a Le Conte’s Sparrow (Ammodramus leconteii). Numerous birders made the trek out to see this apparent 1st county record through at least the 31st (KeS, WD; mob). Another skulker, a Nelson’s Sparrow worked the pickleweed and scrub at Crissy Lagoon in the Presidio, SF on Nov. 30 (JCl). Two more Nelson’s Sparrows appeared periodically at high tide events at Arrowhead Marsh, MLK Jr. RS, ALA, Dec. 18-22 (AM; mob). Harris’s Sparrows arrived Dec. 11 and 12 to feeders in Concord, CC (STi); Pacifica, SM (Joseph Morlan, RFi); and El Granada, SM (KG). Another 1st county record this period was a photogenic Rustic Bunting (Emberiza rustica) that circulated with a junco flock near the Big Rec Ball Fields in GGP, SF, Dec. 6-31 (AH; mob). Wintering Summer Tanagers were reported Nov. 21 at Bolinas, MRN (DH) and Dec. 7 at Lloyd L. in GGP, SF (Durrell D. Kapan). A female Indigo Bunting was a rare winter visitor to Nunes (A) Ranch, PRNS, on Nov. 26 (LK, CD; RM, KH). A few Yellow-headed Blackbirds were spotted Nov. 28 at the Holland Tract, CC, and the flock grew to over 1000 by Dec. 1 (PSc, DWe). A solo Yellow-headed joined a mixed blackbird flock Dec. 21 on Ryer Island, SOL (AC, CG). The blackbird flocks at Mendoza (B) Ranch hosted a Rusty Blackbird (Euphagus carolinus) on Nov. 16 (DG, RM). An Orchard Oriole returned Nov. 18 to its winter grounds at Fort Mason Park, SF (DA; mob). Another Orchard Oriole made a quick appearance Nov. 18 in a Half Moon Bay yard, SM (AJ) and a 3rd Orchard was located Dec. 25 in the Presidio, SF (JCl). A hatch year male Baltimore Oriole frequented Lafayette Park, SF, Nov. 12-Dec. 30 (RiB, RuB; mob). Another Baltimore Oriole padded a SM yard list on Dec. 14 (fide LF). A nutcracker quest to the PRNS Bayview Trail on Nov. 8 produced a bonus Cassin’s Finch (BrM). Another Cassin’s Finch was heard in flight Nov. 12 over NAP Ridge, NAP (MB). Stray Evening Grosbeaks were seen and heard beginning Nov. 6 in Moraga, CC (KaS); Fremont, ALA (JoC); and Santa Rosa, SON (DS). Flocks of 6-12 began appearing Dec. 29, calling in flight over Tilden RP, CC (AL) and foraging on Chinese Pistache berries at Diericx Dr. and Kern Ct., SCL (MDa; mob) and at Charleston Slough, SCL (SP). This month’s column reflects a long overdue update to the taxonomic order to maintain alignment with the Official California Checklist of the CBRC. Taxonomic changes can be vexing to birders, rendering our field guides obsolete with shuffled species order and strange new names for our familiar friends. On the other hand, such changes serve to remind us of the intimate connections between our sport / hobby and the underlying science, how much more remains to be learned about the natural world, and how we as amateur birders can contribute to the quest for knowledge. A female King Eider (Somateria spectabilis) was picked out of a Surf Scoter flock off of Ocean Beach, SF, on Oct. 25 (PS). Unfortunately, the flock continued its southbound migration before other birders could be alerted. The Pescadero Beach Harlequin Duck in SM was last reported on Oct. 4 (RJ, FT, MM, MRo). Another SM Harlequin Duck was located Oct. 22 off of Pigeon Pt. (RT). Flesh-footed Shearwaters entertained pelagic trippers on the 12th in SM waters (JF) and on the 13th over Bodega Cyn., SON (GHu). The Bodega Cyn. trip also featured a flock of 200+ Black-vented Shearwaters that included a Manx Shearwater playing “Where’s Waldo?” (JM, MP, SH). Black-vented Shearwater feeding frenzies were visible from shore with a flock of 300 reported on the 17th from PRNS Lighthouse, MRN (LK), then on the 18th more than 4,000 flying south past Pigeon Pt., SM (RT), and remarkably more than 34,000 (yes, that many zeroes) in swirling masses off of Moss Beach, SM, on the 20th (RT). Up to 10 Fork-tailed Storm-Petrels searched for Halloween treats off of Bodega Head, SON (SC). An Ashy Storm-Petrel wandered inland to Salt Pond A12 in Alviso, SCL, on Oct. 8 (BBo). A Least Storm-Petrel fluttered bat-like over Cordell Bank, MRN, on Oct. 12 (BBi). A Blue-footed Booby (Sula nebouxii) and Northern Gannet (Morus bassanus) continued all month at SE Farallon Island, SF (mob), while a couple Brown Boobies remained on the weather station buoy off of Half Moon Bay through the 12th (DSp; mob). A juvenile Brown Booby was located on the 19th atop Gualala Pt. Island, SON (RK, fide BK). A Least Bittern flushed from the island at Shiloh Ranch Pond, SON, on Oct. 17 (DSw). A juvenile Ruff continued at Salt Pond A12 near the Alviso Marina, SCL, through Oct. 6 (mob). A Baird’s Sandpiper paused Oct. 1 at Las Gallinas Ponds, MRN (JW, RFu, JCl, IS) and 3 more brought up the trailing end of shorebird migration on the 25th at Carmody Pond, SON (SS, GT). A Red Phalarope was ID’d Oct. 20 off of Bodega Head, SON (SC). The Sunnyvale WPCP (SCL) Parasitic Jaeger stuck around Salt Pond A4 through the 10th (BMi; mob). An immature Parasitic Jaeger was noted on the 2nd flying past Hayward’s Landing, ALA (BR). A first-cycle Black-legged Kittiwake came ashore on Oct. 26 at Año Nuevo SR, SM (JCi) and a second Kittiwake turned up the next day at Ocean Beach, SF (PS). On Oct. 5, a White-winged Dove remained fully feathered at Baker Beach, SF (SUM). After disappearing for 3 weeks, a White-winged Dove was refound at Outer PRNS on the 13th, where it was sighted at Mendoza (B) Ranch (JM). A Long-eared Owl called twice on Oct. 4 Mitchell Cyn. in Mt. Diablo SP, CC (LK). On the 16th, a Lesser Nighthawk was discovered roosting on the branch of a pine at PRNS Fish Docks, where it napped off and on through the 22nd (RH, MP, MF; mob). The tail end of Swift migration brought 3 Chimney Swifts across the Golden Gate and into SF airspace over Battery Godfrey on the 2nd (HC, AH, DT). On the 3rd and 4th, 6 Black Swifts accompanied Vaux’s Swifts over Hawk Hill, MRN, (HT, MB, LHC, MP). Two laggard Black Swifts were also reported on the 4th from the Jenner Headlands hawk-watch (BG). A Gray Flycatcher at PRNS Lighthouse gave its distinctive downward tail wag on the 12th (EC). A Philadelphia Vireo was discovered at PRNS Mendoza (B) Ranch, MRN, Oct. 1-2 (DSh; mob). A Red-eyed Vireo spent Oct. 8 exploring the landscaping along the Greenwich steps below Telegraph Hill, SF (MG). On the 11th, another Red-eyed visited a Cole Valley yard in SF (PS). A particularly uncooperative Yellow-green Vireo (Vireo flavoviridis) revealed itself to only 2 birders Oct. 2 and 5 near McClaren Lodge in GGP, SF (BMa, BT). At the other extreme, a Yellow-green Vireo was both photographed and banded at SE Farallon Island, SF, on the 10th (BC, DM). That same day, a Yellow-green Vireo provided a first SON county record at Owl Cyn. near Bodega Bay (GB; DF, DN). Yellow-green Vireos #4 and 5 were reported in MRN on Oct. 14 at PRNS Fish Docks (DF) and on the 29th at PRNS Lighthouse (DSi; DF). A Gray Catbird made a brief appearance Oct. 2 at the PRNS Fish Docks (NW; mob). A Brown Thrasher was located on Oct. 12 in a backyard garden in Pt. Richmond, CC (HAB). An out-of-range Phainopepla turned up Oct. 28 at Coyote Pt. CP, SM (RM; RT). On Oct. 5, an Ovenbird skulked in the undergrowth at PRNS Nunes (A) Ranch, MRN (EF, JCa, NZ; oob). Early October brought a parade of vagrant warblers to eastern GGP, the star being a Prothonotary Warbler that lingered through the 11th at SF Botanical Garden (RB; mob). A Cape May Warbler (Setophaga tigrina) was photographed Oct. 11 on SE Farallon Island (BC, DM). Male and female Black-throated Blue Warblers were admired Oct. 16-23 at Mendoza (B) Ranch, MRN (MP; mob). The female apparently relocated to Nunes (A) Ranch on the 22nd, where she remained through the 24th (DSi; NMN). In SF’s Presidio, El Polin Springs hosted a Black-throated Blue Warbler on the 18th (DA). A Prairie Warbler visited PRNS Fish Docks Oct. 4-10 (MD, oob; mob) and another checked the willows near the Johnston House in Half Moon Bay, SM, on Oct. 15 (CH). A Canada Warbler joined a Black-and-White, Chestnut-sided, Blackpoll, and other warbler celebrities at Half Moon Bay WTP on Oct. 16 (CH, TP, MDF). The weedy fields near the Johnston House in Half Moon Bay attracted a menagerie of sparrows, including a Lark Bunting on the 5th (RT, LB), Brewer’s Sparrow Oct. 12-22 (RT), an American Tree Sparrow on the 13th (DW), and Vesper and Swamp Sparrows on the 15th (RT). Another American Tree Sparrow visited a known sparrow hot spot at Pierce Pt. Rd. MP 4 in PRNS Oct. 27-29 (DSi; MF, LK). Two more Brewer’s Sparrows were both sighted Oct. 1 at Pt. Blue’s Palomarin field station in MRN (mob) and at Nob Hill Pond, SM (RFe). A Vesper Sparrow continued through Oct. 4 at Fort Mason Park, SF (DA). Another Vesper joined Savannah Sparrows at Radio Rd. in Redwood Shores, SM, on Oct. 10 (RT) and yet another Vesper Sparrow turned up in Joseph D. Grant CP in SCL on Oct. 19 (JSP). An early morning visit to Napa Ridge, NAP, on Oct. 19 logged a calling flyover Cassin’s Finch and Evening Grosbeak (MB). Male and female Cassin’s Finches were photographed on Oct. 22 on the NAP portion of Mt. St. Helena (MB). Multiple Evening Grosbeaks were reported around the Bay, beginning Oct. 22 with a flyover at Monte Bello OSP Gates 4, 5, SCL (GHa); perched on a deck railing in the Berkeley Hills, ALA (DQ); in flight over Joaquin Miller Park, ALA (MRa); and flying over Skylawn Memorial Park, SM (RT). September’s fall migration is peak adrenaline season for dedicated vagrant chasers, as southbound migrants encounter the southeastward-trending coastline and find themselves concentrated at coastal hotspots such as Bodega Bay, outer PRNS, GGP, and the SM Coast. This year’s seasonal rhythm was also punctuated by a remarkable incursion of Acorn Woodpeckers to urban parks in Central Oakland and SF. The suspected cause is drought-related acorn crop failures further inland. A Sep. 26 seawatch from Moss Beach, SM, located a Manx Shearwater (RTh). 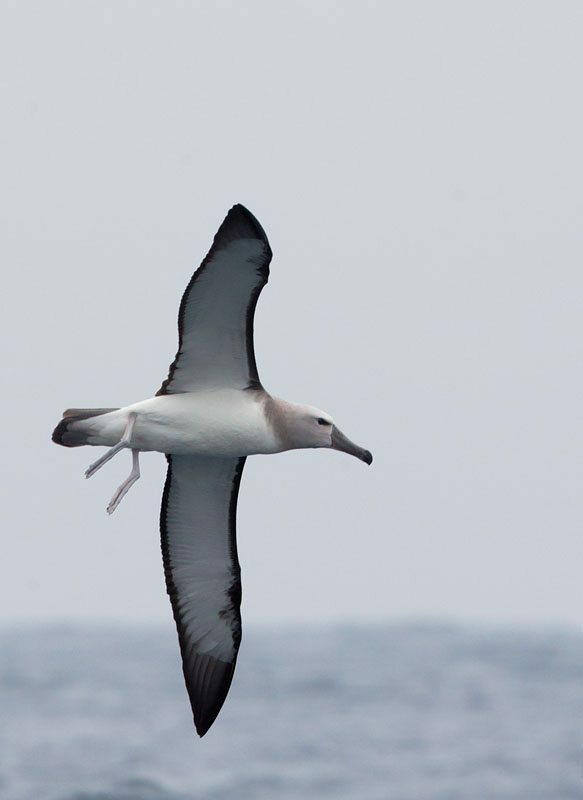 Shearwater Journeys and Jaramillo Adventures ran a number of pelagic trips to SM and SF waters and reports indicated that warm water was bringing in good flocks of Storm-petrels. Most noteworthy was 200 Black Storm-Petrels on Sep. 15, outnumbering Ashy Storm-Petrels that day (DS, BC, oob). Wilson’s Storm-Petrels were reported in 1s and 3s all month and 2 Leach’s Storm-Petrels were located in SF waters on the 23rd (RTa). On Sep. 21, another warm water specialist, a Red-billed Tropicbird, provided distant flight views over SM waters (DS; oob). This species nests in the Gulf of California and Baja Sur and is regular over deep water in Southern California but is almost unheard of in coastal waters north of Monterey Bay. At least 1 Blue-footed Booby (Sula nebouxii) kept the Northern Gannet (Morus bassanus) company all month at SE Farallon Island, SF (DMa, JiT, AS, RS; oob) and on the 30th, a Blue-footed Booby flew past Crissy Field, SF (KL, fide PP). At least 4 Brown Boobies plied SM coastal waters, with 2 adults and 2 juveniles all together on an NOAA buoy on the 15th as the Shearwater Journeys boat headed out to sea. A Least Bittern made a brief appearance on Sep. 9 at the Ellis Cr. Water Recycling Facility, SON (SS). A Harlequin Duck stopped at the Pescadero Cr. mouth, SM, on Sep. 14 (JW, BP). Broad-winged Hawks started moving through the last 2 weeks of the month with a high count of 5 reported from Hawk Hill, MRN, on Sep. 16 (BP, oob). A Black Rail in flight was a rare sight on Sep. 4 near Salt Pond A4 at Sunnyvale WPCP, SCL (BM). A couple Sandhill Cranes soared over Crissy Field Lagoon in the Presidio, SF, on Sep. 20 (ML). Beginning Sep. 23, Pacific Golden-Plovers visited SE Farallon Island, SF (mob); Pilarcitos Cr. in Half Moon Bay, SM (GMC; oob); and Shollenberger Park in Petaluma, SON (MPr, RLB, LH, AW). Beginning Sep. 13, a juvenile Ruff attracted numerous visitors to Salto Pond A12 near the Alviso Marina, SCL (CLa, BM, SM; mob). On the 17th, a Parasitic Jaeger gave chase to a half dozen Elegant Terns near Pt. Isabel RS, CC (AL). Another Parasitic Jaeger pirated fish from the terns at Salt Pond A4, Sep. 28-30 (GZ, CLa, JL; mob). An adult Laughing Gull touched down at Drakes Beach, PRNS, MRN, on the 5th (NMG, ST). A juvenile Sabine’s Gull joined the gull flock at Sunnyvale WPCP, SCL, Sep. 20-29 (KK; mob). It was joined by a second Sabine’s Gull on the 27th. A Royal Tern associating with Elegant Terns at the Elephant Seal Overlook in PRNS was ID’d by voice on Sep. 3 (AE). The Warm water offshore attracted all three southern Murrelets this month. On the 21st, SM pelagic trippers got excellent looks at a Guadalupe Murrelet (DS; oob). On the 28th, a boat trip to SE Farallon Island reported a Craveri’s Murrelet (RW) and the next day, researchers on the island documented a Scripps’s Murrelet. A Sep. 21 visit to PRNS Fish Docks, MRN, produced a White-winged Dove (DG; mob). A Long-eared Owl on Salmon Cr. Rd. was a welcome addition to a SON big day tally on the 27th(MPr, RLB, LH, AW). A day-roosting Common Poorwill was discovered Sep. 1 at the CCFS banding station, SCL (MR). 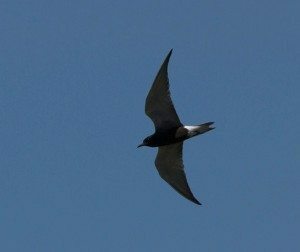 Black Swifts migrated through the area Sep. 6-19 with a high count of 29 birds passing Hawk Hill, MRN, on the 16th (BP, oob). A Chimney Swift was spotted Sep. 10 in flight over SE Farallon Island, SF and a second bird was observed there on the 20th (Oliver James). A female Calliope Hummingbird was found Sep. 3 at Vasona L. CP, SCL (BM). An immature male Selasphorous hummingbird at the Wildlife Gallery in Bolinas on the 27th was identified as a Rufous Hummingbird based on date (RDG, ME). 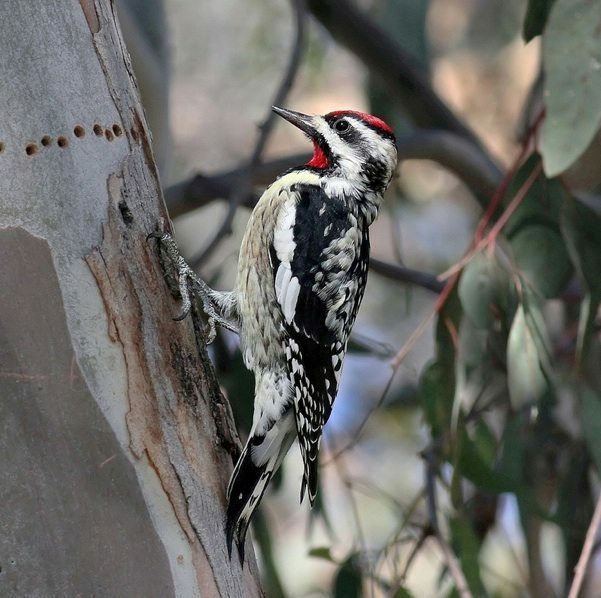 A Lewis’s Woodpecker made an urban foray to Buena Vista Park, SF, Sep. 12-13 (KJ; mob). A Yellow-bellied Flycatcher (Empidonax flaviventris) was documented Sep. 10 on SE Farallon Island (mob). Several Least Flycatchers made the news this month: photographed Sep. 6 at L. Merced, SF (HC, ME); 1-2 birds Sep. 18-21 in East Wash and Fort Miley East in Lincoln Park, SF (HC; oob); and Sep. 28-29 at PRNS Lighthouse, MRN (CC; oob). A Gray Flycatcher was banded Sep. 1-4 on SE Farallon Island (mob); another was studied Sep. 8-10 at PRNS Fish Docks, MRN (LK; mob); and a third was located Sep. 17 at Nunes (A) Ranch, PRNS, MRN (BoA, BeA). A Sulphur-bellied Flycatcher (Myiodynastes luteiventris) was photographed Sep. 6 at El Polin Springs in the Presidio, SF, but could not be refound (BG). A Plumbeous Vireo was studied on the 1st at Tunitas Cr. Rd. at Lobitos Cr. Cutoff, SM (GHa); another was discovered on the 3rd at Putah Cr. Riparian Reserve, SOL (RR); and a third was banded on the 20th on SE Farallon Island (mob). Philadelphia Vireos on Sep. 3 were ID’d at PRNS Fish Docks, MRN (PC) and at Owl Cyn., SON (GHu). Beginning the 20th, another Philly Vireo joined a Warbling Vireo at Mendoza (B) Ranch, PRNS, MRN (EC; mob). A Red-eyed Vireo from Aug. 29 was refound on the 5th at Owl Cyn., SON (mob). A Yellow-green Vireo (Vireo flavoviridis) became a local celebrity Sep. 19-20 at Lincoln Park–East Wash, SF (HC; mob). Another Yellow-green Vireo added to a yard list already chock full of rarities in the Granelli neighborhood of Half Moon Bay, SM (AJ). A continuing Gray Catbird skulked in the undergrowth of Owl Cyn. through the 13th (mob) and another Catbird feasted on dogwood berries in Sheffield Village, Oakland, ALA, on the 29th (DV). A Brown Thrasher took refuge on SE Farallon Island on the 29th (mob). A couple Red-throated Pipits flew over SE Farallon Island on the 19th and 22nd (DMa, oob). Also detected by ear was a Red-throated Pipit at Abbotts Lagoon, PRNS, on the 24th (MS). A final Red-throated Pipit caught a jogging birder’s attention Sep. 24-25 along Pilarcitos Cr. in Half Moon Bay (AJ; mob). At least 1 and probably 2 Cape May Warblers (Setophaga tigrina) visited Outer PRNS, MRN, this month, starting Sep. 4 at PRNS Lighthouse (JM, MF). Presumably the same bird was refound the 6th at nearby Nunes (A) Ranch (GHu; mob) then no reports for 2 weeks. On the 19th, the same or a different bird was located again at the PRNS Lighthouse (MPk, ZB; mob) and for the next 4 days it apparently moved around to Mendoza (B) and Nunes (A) Ranches (mob). On the 28th, a hatch-year Connecticut Warbler (Oporornis agilis) was found foraging on the ground below the pines at the PRNS Fish Docks (CC, oob; mob). A Mourning Warbler (Geothlypis philadelphia) lingered Sep. 10-29 on SE Farallon Island (mob). Best of the warbling rest included 1 Northern Parula; 13 Tennessee, 15 Chestnut-sided, 2 Magnolia, 3 Blackburnian, 4 Prairie, 3 Palm, 2 Bay-breasted, 12 Blackpoll, 1 Canada, and 4 Black-and-white Warblers; 20 American Redstarts; 3 Ovenbirds; 11 Northern Waterthrushes; 1 Painted Redstart; and 3 Yellow-breasted Chats. An adult male Summer Tanager took up dog watching in Buena Vista Park, SF, Sep. 8-17 (KJ; BF). Green-tailed Towhees were located 2 miles apart along the Mt. Vaca area of Blue Ridge Rd., SOL, on Sep. 1 and 7 (EP). A half dozen Vesper Sparrows moved in beginning Sep. 5 to PRNS Lighthouse, MRN (MPk; EC); Mt. Davidson, SF (DMo, MPk); Black Mountain, Monte Bello OSP, SCL (GHa, MW); Skylawn Cemetery, SM (GC); Coastal Trail, SM (JC); and Fort Mason Park, SF (LS, ME; DA). A Black-throated Sparrow was photographed Sep. 26 atop Mt. Davidson, SF (BF; LS, CLo). The dry rattle of a Lapland Longspur flight call was heard Sep. 16 over Abbotts Lagoon, PRNS (JM). A Painted Bunting brightened the landscape on SE Farallon Island, SF, on Sep. 22 (mob). A Bobolink was flushed from the rushes at Abbotts Lagoon, PRNS, on the 6th (mob). A bright orange Baltimore Oriole was discovered Sep. 12-14 at PRNS Lighthouse (LK; mob) and another was found Sep. 20 at Sierra Pt. in S. SF, SM (RTh). Abbreviations for Observers: AE, Andy Engilis; AJ, Alvaro Jaramillo; AL, Albert Linkowski; AS, Adam Searcy; AVN, Andrew VanNorstrand; AW, Alan Wight; BC, Bruce Christensen; BeA, Bettina Arrigoni; BF, Brian Fitch; BG, Bob Gunderson; BM, Brooke Miller; BoA, Bob Arrigoni; BP, Bob Power; CC, Chris Conard; CLa, Caroline Lambert; CLo, Calvin Lou; DA, David Assmann; DG, Daniel George; DK, Durrell Kapan; DMa, Dan Maxwell; DMo, Dominik Mosur; DS, Debi Shearwater; DV, Debbie Veiss; EC, Everett Clark; EP, Eric Pilotte; GC, George Chrisman; GG, Geoffrey Geupel; GHa, Garth Harwood; GHu, Gene Hunn; GMC, Gerry McChesney; GZ, Gena Zolotar; HC, Hugh Cotter; JC, Jeff Cislini; JeT, Jerry Ting; JiT, Jim Tietz; JL, Jasen Liu; JM, Jeff Miller; JW, James Wilson; KJ, Kimberly Jannarone; KK, Kathy Kleinsteiber; KL, Kirsten Lindquist; LH, Lisa Hug; LK, Logan Kahle; LS, Linda Swanson; ME, Mark Eaton; ME, Megan Elrod; MF, Mark Forney; ML, Mark Lenz; MPk, Michael Park; MPr, Mike Parmeter; MR, Mike Rogers; MS, Mark Sawyer; MW, Matt Wyatt; NMG, Nate McGowan; PC, Peter Colasanti; PP, Peter Pyle; RDG, Ryan DiGaudio; RLB, Rick Le Baudour; RR, Ruth Rudesill; RS, Robert Snowden; RTa, Rick Taylor; RTh, Ron Thorn; RW, Rudyard Wallen; SM, Sonny Mencher; SS, Scott Sorby; ST, Steve Tucker; ZB, Zach Baer. A Red-necked Grebe in breeding plumage was spotted on L. Hennessey, NAP, on Aug. 14 (JCe). This bird would be the third county record and the first report since the 2009 record, also from L. Hennessey. But such records pale in comparison to SM Co.’s spectacular Salvin’s Albatross, discovered Jul. 26 on an Alvaro’s Adventures pelagic trip out of Half Moon Bay (AJ; mob). The West Coast’s most famous Northern Gannet (Morus bassanus) continued to split his time between Sugarloaf on the SE Farallon Islands and Alcatraz Island, both in SF (mob). He was joined this period by a remarkable Sulidae invasion. On Aug. 12, an adult Masked Booby (Sula dactylatra) was spotted from a Moss Beach sea watch, SM, and on the 25th, the same site yielded a juvenile Masked/Nazca Booby (Sula dactylatra/granti) (RT). Not 1 but 2 Blue-footed Boobies (Sula nebouxii) loitered on SE Farallon Island’s Sugarloaf Aug. 5-31 (PeW, fide PP; mob) and at least 2 Brown Boobies were located there on Aug. 3 (DSh; mob). Along the SM coast, Brown Boobies were noted on Jul. 23 from Moss Beach (RT) and on the 29th near Devil’s Slide Trail CP (AJ, oob). Throughout July, up to 4 adult and juvenile Least Bitterns were espied in the cattails at Las Gallinas Valley Sanitary District, MRN (EC; mob). Least Bitterns also apparently nested successfully at Dow Wetlands Preserve, CC, where an adult and juvenile were noted Jul. 14-20 (AL; LK). A Little Blue Heron was spotted on Jul. 20 wading at the edge of a small island in Salt Pond A16, SCL (KK). The elusive Black Vulture (Coragyps atratus) of SON Co. was relocated Aug. 7-8 and photographed at a deer carcass with Turkey Vultures in Larkfield, Santa Rosa (SJ; fide CT). As previously reported, a female Common Black-Hawk (Buteogallus anthracinus) set up house-keeping with a Red-shouldered Hawk and by early July, the pair had successfully fledged a chick (mob). Shollenberger Park (SON) hosted an American Golden-Plover (Pluvialis dominica) Aug. 14-16 (NA; Chris and TW) and a Pacific Golden-Plover Aug. 20-23 (LH; LA, KS). Molting adult Pacific Golden-Plovers were reported Aug. 17 at Nob Hill Pond, SM (AD) and Aug. 23-25 at New Chicago Marsh, SCL (PiW; mob). Ruddy Turnstones made inland forays to American Cyn. Wetlands, NAP, on Jul. 19-21 (MB; MP, DM); to Salt Pond A16, SCL, on Jul. 21-23 (BB); to Salt Pond A9 on Aug. 10 (GZ); and to Benicia Pier, SOL, on the 29th (RM; EP). CC recorded its first Red-necked Stint (Calidris ruficollis), an adult bird in breeding plumage, at the West County Wastewater District Sewage Ponds on Jul. 20-22 (LK; mob). On Jul. 21, a male Ruff in mostly alternate plumage was located along the Napa River Bay Trail at American Cyn. Wetlands (RR). A Red Phalarope made landfall Jul. 20 at Waterbird Regional Preserve, CC (AL) and a second bird showed up Aug. 3 at the Pedrick Rd. Sewage Ponds, SOL (RM). Long-tailed Jaegers typically stay far out to sea but a couple were reported wandering around the Bay, including a dark juvenile that got as far as Benicia Pier on Aug. 29th (EP, RM). Thousands of Sooty Shearwaters congregating off of Pigeon Pt., SM, attracted a Sabine’s Gull on July 28 (MK). Between Aug. 9 and 13, up to 5 Black Terns joined the Forster’s-Caspian-Elegant Tern mobs on Salt Ponds A9 and A10, SCL (MH; mob). A solo Black Tern was noted flying south along the coast at Moss Beach on the 27th (RT) and then photographed later that morning in Half Moon Bay (NL, fide AJ). Warm water brought Scripps’s and Craveri’s Murrelets to the SM & SF coast, where they were found in 1s and 2s on the pelagic trips on Jul. 20, 26, and 30 and Aug. 16 (AJ, DSh; mob). Tufted Puffins were noted on the SM coast from sea watches on Jul. 12 and Aug. 20 (RT). A Lesser Nighthawk materialized Aug. 16 at Putah Cr. Riparian Reserve, SOL (SN). In Bolinas, MRN, a Costa’s Hummingbird visited a feeder on Jul. 26 (KHo, HL) and a Black-chinned Hummingbird provided art inspiration at the Wildlife Gallery on Sep. 5 (KHa). A calling Hammond’s Flycatcher was located Aug. 10 and again the 25th in Milliken Cyn. (Private), NAP (MB). A likely over-summering Tropical Kingbird was reported Aug. 22 at SamTrans Marsh, SM (GM). An Eastern Kingbird loitered Aug. 6-24 near Drake’s Corner, PRNS, MRN (EH; mob). A Red-eyed Vireo made a couple brief appearances at Owl Cyn. in Bodega Bay, SON, on Aug. 29 and 31 (DE; BM). A gulp of 6 Purple Martins hawked insects at Almaden Res., SCL, Jul. 15-27 (JP); a juvenile was noted sporadically at Princeton Harbor marsh, SM, Jul. 29-Aug. 16 (MDF; AJ, WB); and another individual paused Aug. 2 at Sunnyvale WPCP, SCL (FV). A few Bank Swallows were picked out of swallow swarms around the region: July 9 at Las Gallinas Valley Sanitary District (LK); Jul. 11 at Coyote Pt., SM (RT); and Aug. 17 at Sheehy Cr., NAP (MB). A Canyon Wren contributed to a Los Gatos, SCL, yard list on Aug. 6 (MH). A Gray Catbird rewarded patient visitors to Owl Cyn. in Bodega Bay beginning Aug. 28 (PC). This bird is likely the same one reported from Hole-in-the-Head on Jun. 8. A Prairie Warbler was discovered Aug. 25 at Mendoza (B) Ranch, PRNS, MRN (DSi; EC). The same or a different bird was located the 30th at the Fish Docks (JCh; DG, CC). A Prothonotary Warbler was found foraging in the trees around Pescadero Marsh, SM, on Aug. 26 (MC) and the same site yielded an Ovenbird on Sep. 1 (RT). A Canada Warbler joined a large gleaning flock along Gazos Cr. Rd., SM, on Aug. 31 (GH; mob). Other warbling vagrants included 1 Tennessee and 3 Black-and-white Warblers, 7 American Redstarts, and 4 Northern Waterthrushes. A Green-tailed Towhee popped out of some grapevines along Mix Cyn., NAP, on Aug. 30 (EP) and 2 more were found the same day along Blue Ridge Rd., SOL (EP, RM). The region saw its FOS Clay-colored and White-throated Sparrows this period. A Brewer’s Sparrow ascended Mt. Davidson, SF, on Aug. 27 (BF) and a Vesper Sparrow joined a White-crowned flock at PRNS Lighthouse the same day (DSi). A half-dozen Rose-breasted Grosbeaks were reported around the Bay Area. A Painted Bunting found dry land on SE Southeast Farallon Island on Aug. 18-22 and, beginning the 27th, the island hosted a Baltimore Oriole (mob). The continuing Northern Gannet (Morus bassanus) stuck to its roost on Alcatraz Island, SF, through at least the 22nd (mob). Nine White-faced Ibis appeared on Jun. 4 at the pond across Adobe Rd. from Wagner Lane, SON (MP, fide AW). Another ibis flew over the main pond at Pacific Commons Linear Park, ALA, on the 18th (SF). Other birds of interest this month were a Horned and an Eared Grebe and geese and ducks that typically summer far to the north: 1 Greater White-fronted Goose, 3 Cackling Geese, 5 American Wigeons, 6 Redheads, 6 Greater and 1 Lesser Scaup, 1 White-winged Scoter, 1 Long-tailed Duck, 4 Common Goldeneyes, and 6 Red-breasted Mergansers. The Common Black-Hawk (Buteogallus anthracinus) that has been lurking for the last decade in the Laguna de Santa Rosa, SON, was found this spring nesting with a Red-shouldered Hawk in a eucalyptus tree adjacent to the parking lot of a nearby winery (mob). Birding visitors are reminded to be respectful on private property and encouraged to enjoy the tasting room wares. Black Rails continued to call from known nesting marshes around the Bay this month, with a high count of 9 on Jun. 3 at Benicia SP, SOL (EP; SR). An adult Black Tern was seen on Jun. 3 from the Least Tern sign at Hayward RS, ALA (BD). An alternate-plumaged Ancient Murrelet was noted 2 days later from the Mile Rock overlook at SS SF Memorial, SF (DMu). On the 21st, a presumed Common Nighthawk was found commuting along Highway 24 in Oakland, ALA (JW). A couple of Black Swifts prowled the airspace over Año Nuevo SR, SM, Jun. 16–20 (JC; MDF, CH). Black-chinned Hummingbirds remained a feature along the Los Gatos Cr. Trail, SCL, where up to 11 were reported on the 11th (JP). That same day to the north, a single male visited a Lafayette feeder, CC (Kai Mills). An errant Rufous Hummingbird was located Jun. 14 at Lands end, SF (DW). A Cassin’s Kingbird wandered to Nunes (A) Ranch, PRNS, MRN, on the 11th (AL, NA). A singing Yellow-throated Vireo attracted attention Jun. 4–5 in Owl Cyn. at Bodega Bay, SON (DN; mob). A Plumbeous Vireo was well described on the 19th at San Bruno Mountain Park, SM (DP). On the 2nd, a Red-eyed Vireo visited Edgewood Park and Natural Preserve, San Carlos, SM (MC). Another Red-eyed Vireo encamped Jun. 6–14 atop Mt. Davidson, SF (DMo; mob). A family group of 4 Gray Jays was found squabbling along Annapolis Rd., SON, on Jun. 25 (RR). On the 7th, Sunol Regional Wilderness, ALA, hosted an American Dipper for the 1st time since 1999 (SB). A male Mountain Bluebird visited Bloomfield Cemetery between Petaluma and Valley Ford, SON, on the 2nd (GH). A Gray Catbird drew visitors to Ano Nuevo SR, SM, Jun. 25–26 (JP; mob), and another Catbird skulked at Hole-in-the-Head in Bodega Bay, SON, on the 8th (DAH). A Prothonotary Warbler eluded Alger Hiss Jun. 4–6 at Drakes Beach, PRNS, MRN (RR; mob). An Ovenbird loitered around the PRNS Lighthouse, MRN, Jun. 3–4 (MDF; mob). Other vagrant warblers along the coast this month included 1 Northern Parula; 4 Chestnut-sided, 3 Magnolia, and 1 Bay-breasted Warbler; 8 American Redstarts; and 1 Northern Waterthrush. A singing Brewer’s Sparrow was located Jun. 18 at the PRNS Fish Docks, MRN (NA, DS). A Blue Grosbeak strayed to the PRNS Lighthouse, MRN, on the 4th (RR, DF), and another visited Windy Hill OSP, SM, on the 25th (MC). An Indigo Bunting continued through the 25th along the Loma Alta Fire Rd. near Lucas Valley, MRN (mob). A 2nd Indigo Bunting was located May. 31 at Skyline Ridge OSP, SM, where it lingered through the 7th (COC, MDF; mob). A flock of 15 Yellow-headed Blackbirds colonized the Double M Dairy, MRN, on the 30th (BE). On Jun. 3, a Common Grackle (Quiscalus quiscula) attracted attention at the PRNS Lighthouse, MRN (MDF). A Yellow-billed Loon (Gavia adamsii) sighting on May 23 at Clifton Court Forebay, CC, was remarkable not only for the species but also for the date and location (AL). Slightly less remarkable but still noteworthy, a Red-necked Grebe showed up May 15 on L. Hennessey, NAP (MB). 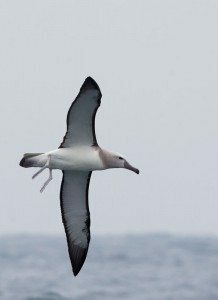 A May 4 pelagic trip to SF waters scored 2 Laysan Albatrosses (AJ). A deep-water repositioning cruise recorded 5 Murphy’s and 10 Cook’s Petrels as it passed through SM waters on May 1 (RT). A May 30 seawatch from Pigeon Pt., SM, found an unseasonal Black-vented Shearwater (RT). The Northern Gannet (Morus bassanus) continued to delight admirers all month from its roost on Alcatraz Island, SF (mob). White-faced Ibises were reported on the 11th at Ellis Cr. Water Recycling Facility, SON (JH); on the 15th at Gilroy WTP, SCL (CL); and on the 16th at Charleston Slough, SCL (AB). A lingering pair of American Wigeons paddled a slough near Palo Alto Baylands, SCL, on May 30 (WB). A Harlequin Duck remained through the 9th at Pescadero SB, SM (GH). A male White-winged Scoter remained local through May 30 at Blufftop Coastal Park, SM (AJ). In the S. Bay (SCL), daytime-calling Black Rails were reported on the 4th near Salt Pond A17 (PD) and again in the 25th along the Alviso Slough loop trail at Salt Pond A10 (BM). A northbound Pacific Golden-Plover paused May 7 at San Leandro Marina, ALA (BRi). A couple of Solitary Sandpipers continued through the 3rd at Los Gatos Cr. Park, SCL (MH; LS), and at Chiles Cr. at L. Hennessey (MB). Sutro Baths in SF hosted 5 Wandering Tattlers on the 6th and 3 more were located on the 9th at Pescadero SB, SM (GH). A couple of Ruddy Turnstones wandered inland on May 4 to American Cyn. Wetlands, NAP (MB). A Semipalmated Sandpiper visited Lawson’s Landing near Dillon Beach, MRN, on the 12th (DSi). A flyover Baird’s Sandpiper rewarded a May 6 seawatch from Pigeon Pt. (RT). The 2nd spring Pectoral Sandpiper report in 2 months came on May 6 from Bolinas Sewage Ponds, MRN (RCo,TG; ME, MDe). Doves to ThrashersA Laughing Gull entertained observers on May 3 at Bodega Bay Harbor, SON, and the same crew discovered a Franklin’s Gull just up the coast at the Russian River Mouth in Jenner (RLB, DH; LH). A 2nd Laughing Gull was reported on the 14th at Meeker Slough in Richmond, CC (AL), and the region’s 2nd Franklin’s Gull winged past Pigeon Pt. on the 20th (RT). A late Glaucous Gull lingered at San Leandro Marina, ALA, through the 7th (BRi). A pair of migrating Black Terns paused at Gilroy WTP, SCL, on May 12 (MH). Ancient Murrelets were spotted off of Bodega Head, SON, on the 5th (LH) and off the SF coast on the 10th (PS). On the 28th, a Yellow-billed Cuckoo was heard searching for remnant riparian habitat at Benicia Community Park, SOL (DSw). Black Swifts migrated north in 1s and 2s this month, generally along coastal ridges in the company of foraging swallows (mob). A swallow flock over the Jasper Ridge Biological Preserve in Portola Valley, SM, on the 18th included a Chimney Swift along with a few Vaux’s Swifts (RT, LB). Black-chinned Hummingbirds were reported regularly in the Willow Glen neighborhood of San Jose and along the Los Gatos Cr. Trail, SCL (BM, BB; mob). Farther north, a solo female Black-chinned Hummingbird made her way to Sign Hill Park in S. SF, SM, May 12–13 (BT; LG). A May 3 Calliope Hummingbird at Spring Valley in Ed Levin Park, SCL, represented the tail end of spring migration for that species (EG, MDo). Gray Flycatchers passed through on the 12th and 13th at the Log Cabin in the Presidio, SF (DK, DM, LK), and at San Bruno Mountain County and SP, SM (RT). Dusky Flycatchers followed a day later at Mt. Diablo SP, CC (MP), and at the Winton Ave. entrance to Hayward RS, ALA (BRi). An overwintering Tropical Kingbird continued all month at SamTrans Marsh, SM (DP), and another appeared May 14 at Shoreline L., SCL (FV). The May 13 migrant wave featured a probable Blue-headed Vireo (Vireo solitarius) foraging in a cypress tree near Fort Mason Community Garden, SF (EB). Migrating Bank Swallows paused on May 19 at Spring L. RP in Santa Rosa, SON (RR), and on the 20th at Princeton Salt Marsh, SM (MDF, CH). A visit to the Saratoga Springs campground and group picnic area, SCL, on the 29th revealed an American Dipper (AJ, SP, oob). Vagrant warblers began to push through in late May, starting with a singing Black-and-white Warbler on the 18th along Gazos Cr. Rd. (GH). Beginning the 21st, a singing Northern Parula spent a week along Pine Flat Rd. east of Healdsburg, SON (RCi; RR). Ovenbirds showed up May 24 and 25 at Buena Vista Park, SF (KJ; AW), and at Aberdeen Way in Inverness, MRN (RCo, TG). A late Summer Tanager was reported May 26 from Lafayette Park in SF (RB). A very late Clay-colored Sparrow was discovered May 14 along Pilarcitos Cr. in Half Moon Bay, SM (MDF, CH). Annual surveys of the 2007 Lick Fire burn area in Henry Coe SP, SCL, have regularly turned up small numbers of Black-chinned Sparrows, but this year’s survey produced a whopping 16 singing males along Black Mountain Rd. (MR, RJ). The hybrid male Rose-breasted x Black-headed Grosbeak returned for its 5th season to Gazos Cr. Rd., SM, beginning May 10 (GH; mob). A pure Rose-breasted Grosbeak was found at the same location on the 29th (MDF, CH). Elsewhere, another Rose-breasted Grosbeak appeared May 14 at the Winton Ave. entrance to Hayward RS (BRi) and on the 26th near Fort Miley in SF (PS, HC). Blue Grosbeaks were confirmed at their traditional nesting site along the Pajaro River, SCL, on the 19th (GZ, BRe). Additional Blue Grosbeaks were reported May 29–31 from Marsh Cr. Regional Trail and Big Break RP, CC (ES, WH; CS), and on the 31st along lower Coyote Cr. below Dixon Landing Rd., SCL (SR). A male Indigo Bunting attracted visitors to the Loma Alta trail off of Lucas Valley Rd., MRN, May 14–31 (RH, JM; mob), and another Indigo Bunting surprised a field trip to Skyline OSP, SM, on the 31st (COC, MDF, CH, oob). Last but not least, a solo Yellow-headed Blackbird associated with the Red-winged Blackbird flock at Pacific Commons Linear Park, ALA, on the 16th (JT). April brought us the onset of spring migration and with it Birdathon fundraisers and Big Day record attempts. An Apr. 14 seawatch from Pigeon Pt., SM, yielded a Black-footed Albatross (RT). Beginning Apr. 13, the Northern Gannet (Morus bassanus) that had been roosting at SE Farallon Island over the last 2 years relocated to Alcatraz Island, SF (BS; mob). The gannet was visible from land at Aquatic Park, where it could be seen performing courtship rituals for the neighboring cormorants. L. Elizabeth in Fremont, ALA, hosted 2 or 3 Cattle Egrets on Apr. 16 (JT). Five White-faced Ibises flew over San Leandro Marina, ALA, on the 9th (BRi). Another Ibis flew over SF on the 24th (JCl). On the 30th, ibises were reported from Albany mudflats at Eastshore SP, ALA (WB), Battery Godfrey, SF (PSa, HC), and Don Edwards NWR in Alviso, SCL (BMi). On the 13th, the Bay Area’s 1st Black Vulture (Coragyps atratus) was refound in a Turkey Vulture kettle above Joy Rd. in SON (DM, BMa, LH, LK; DSw, JL, GB). First found on Mar. 22 over Tolay Cr. Ranch, the Black Vulture lingered a day at a calf carcass and then moved with the Turkey Vulture kettle to Laguna Rd. and Guerneville Rd., near Sebastopol, where it was last reported on the 16th. A Tufted Duck continued through Apr. 14 at Stafford L. in Novato, MRN (KH). A Harlequin Duck moved through Drake’s Beach, PRNS, MRN, on the 2nd (Jeff Miller). Long-tailed Ducks were reported from Pigeon Pt., SM (RT); PRNS Fishdocks, MRN (ME, TG, RC, MD); and Doran Beach, Bodega Bay, SON (DSh, LB, oob; mob). Spring migration brought a Broad-winged Hawk floating over Corona Hill, SF, on the 24th (DM). A Pacific Golden-Plover paused Apr. 13 at Ravenswood, SM (GM). A Big Day scouting trip on Apr. 9 located a Marsh Sandpiper (Tringa stagnatilis) foraging with numerous yellowlegs in a canal along Liberty Island Rd., SOL (RM; mob). The bird lingered through the 12th, thus providing life looks to numerous birders. Fide PL, the previous N. American records of Marsh Sandpiper consist of 1 in CA in late fall of 2013 near the N. end of the Salton Sea, about 6 or 7 fall records from Alaska, and 1 fall record from Ensenada, Mexico. Five Solitary Sandpipers migrated through the region beginning Apr. 23: L. Elizabeth in Fremont, ALA (DD, JT); Los Gatos Cr. CP in Campbell, SCL (LM; mob); Angwin Wastewater Treatment Plant, NAP (FH); and Llagas Cr. upstream of Chesbro Res., SCL (PDu). A Pectoral Sandpiper on the 21st at a salt marsh pond along Highway 84, SM, represented just the 7th spring record for the Bay Area since 2005 (RT). Red Phalaropes moved through the region beginning Apr. 16 with the high count of 8 birds during a Pigeon Pt. seawatch, SM (RT). A 1st cycle Glaucous Gull returned to L. Merritt in Oakland, ALA, Apr. 9–10 (MR; JB). A 2nd bird remained through the 16th at Gazos Cr. mouth, SM (RT). On the 27th, a Sabine’s Gull was found foraging above the marshes and channel of Tomales Bay to the south of the Inverness Store, MRN (DSi, PP). The season’s 1st Black Swift winged over Battery Godfrey, SF, on Apr. 30 (AH). Black-chinned Hummingbirds are expected nesting birds in SCL. Less expected was a reported male at a feeder in Pleasant Hill, CC, on the 20th (DR). Calliope Hummingbirds started migrating through on the 12th with a high count of 15 on the 26th at Mitchell Cyn. in Mt. Diablo SP, CC (CL, DHe, JCh; mob). The continuing Lewis’s Woodpecker at Crane Cr. RP, SON, was last reported on the 15th (mob). Three overwintering Tropical Kingbirds remained in the region this month: through the 4th at West County Wastewater District Plant, CC (mob); through the 7th at SamTrans Marsh, SM (DP); and through at least the 20th at Heather Farms Park in Walnut Cr., CC (mob). Nesting Purple Martins returned to Loma Prieta Rd. at Summit Rd., SCL, by the 9th (DWe; BRe, MM), and migrants were noted on the 19th at Alviso Marina, SCL (MH); on the 20th at Calaveras Res., SCL (RF, JCl, LK); and on the 30th at Bolinas, MRN (KH, PP). A Canyon Wren returned to the Hazel Atlas Portal at Black Diamond Mines SP, CC, by Apr. 21 (PSc, NS). A couple of Townsend’s Solitaires were located on the 17th below the N. Peak of Mt. Diablo SP, CC (DWi), and another was reported on the 30th on private property along NAP/SOL Co. line (MB). An early migrant or overwintering Northern Waterthrush was located Apr. 16 at Stow L., GGP, SF (LS). The season’s 1st Yellow-breasted Chat showed up on the 29th along Llagas Cr. upstream of Chesbro Res., SCL (AV; JP). The Marsh Rd. (SCL) Lark Bunting continued through Apr. 3 (SL). Two locally rare Grasshopper Sparrows were found feeding on the southern slope of Bernal Heights Park, SF, on the 7th (RF). An immature male Rose-breasted Grosbeak tarried Apr. 8–12 at Santa Rosa Cr. trail at Willowside Rd. in Santa Rosa, SON (DK; mob). Another male Rose-breasted Grosbeak lingered Apr. 14–19 at La Rinconada Park in Los Gatos, SCL (GZ; mob). A migrant Blue Grosbeak paused on the 13th at Oka Ponds in Campbell, SCL (OA), while nesting Blue Grosbeaks returned to Patterson Pass Rd., ALA, by the 26th (SH). An Indigo Bunting returned to the N. slope of Mt. Diablo on the 19th, this time to the mustard weeds above Bullfrog Pond along the Sugar Loaf-Shell Ridge Trail, CC (BP). A couple of Orchard Orioles visited Fort Mason Community Garden, SF, Apr. 2–9 (BG, BF; DA). Red-necked Grebes are reasonably regular along the coast, but 1 or more made bayside forays on Mar. 7 and 10, first to the Ayala Cove boat landing area at Angel Island, MRN (DWm), and then to San Lorenzo Cr. channel, ALA (AHo). Another coastal regular, a Northern Fulmar, was found sitting on the water west of the Berkeley Marina, ALA, on Mar. 2 (SD). Careful scrutiny of a shearwater off the coast at Cliff House, SF, on Mar. 2 revealed dark underwings, indicating Short-tailed Shearwater (JC). A probable female Brown Booby was noted on Mar. 19, flying S. past Ocean Beach, SF, into SM waters (DM). A Mar. 22 expedition to Tolay Cr. Ranch, SON, discovered a soaring Black Vulture (Coragyps atratus) in among the Turkey Vultures (SP, JC). If accepted, this sighting would constitute a 1st Bay Area record. A Tundra Swan was observed Mar. 15 interacting with Mute Swans at Shollenberger Park in Petaluma, SON (PC). A Eurasian Green-winged Teal was ID’d Mar. 27 along Stevens Cr. in Mountain View, SCL (MH). A Tufted Duck continued through Mar. 6 at Stafford Lake in Novato, MRN (DS). A male Harlequin Duck showed up sporadically Mar. 7–20 below Bodega Head, SON (DWl, DAH; mob). The Richmond Marina (CC) Black Scoter was refound Mar. 15 just offshore of Vincent Park (LLo). A female Long-tailed Duck was tallied Mar. 3 as part of the Richardson Bay Audubon Sanctuary survey in MRN (LLe, fide KW). Another Long-tailed Duck appeared Mar. 18 at Bodega Head (DW). A returning Swainson’s Hawk soared over Battery Godfrey, SF, on the 15th (PS), and another was photographed over Giacomini Wetlands, MRN, on the 28th (RS, TP). On the 13th, a farmworker photographed a Crested Caracara (Caracara plancus) standing in the field adjacent to the Pescadero Post Office, SM (fide MK). If this is the same bird that has been roaming the N. CA coast for the last 10 years, birders may wish to keep an eye on Swanton Rd. near Davenport, SCZ, where the bird settled in 2005. On Mar. 4, the gull flock at Upper Crystal Springs Reservoir, SM, included an adult Slaty-backed Gull (Larus schistisagus) (RT). Glaucous Gulls were reported Mar. 7 at Newby Island Recyclery, SCL (JSP); Mar. 15–18 at Ogier Ponds, SCL (AE; CL); and Mar. 16 at Gazos Cr. mouth, SM (GH). An Ancient Murrelet flew N. past S. Ocean Beach, SF, on the 8th (DM). On Mar. 30, a Spotted Owl was heard calling from LandPaths Riddell Preserve west of Healdsburg, SON (DB). Short-eared Owls were observed on the hunt Mar. 12 at Las Gallinas Valley Sanitary District, MRN (SF, DE), and the 26th at Pacheco Marsh in Martinez, CC (JB). A male Costa’s Hummingbird visited a feeder in Los Altos, SCL, on the 21st (AHe). A Lewis’s Woodpecker remained faithful to Crane Cr. RP, SON, throughout the month (mob). SCL remained Sapsucker Central with 2 Yellow-bellied and 3 Red-naped Sapsuckers. Yellow-bellied Sapsuckers loitered at Ed Levin Park (mob) and at the Geng Road parking lot in Palo Alto (JM). Red-naped Sapsuckers stuck around at Ulistac Natural Area in SCL (mob); at SCL Valley Water District (mob); and at the Rancho Canada Del Oro OSA parking lot (JP). An eBirder reported an adult male Vermilion Flycatcher on Mar. 6 at Harley Farms, SM (SL). The overwintering Tropical Kingbird remained all month at Heather Farms Park in Walnut Creek, CC (mob), whereas the S. Lake Merced, SF, bird was seen only on the 1st (DA). A 3rd Tropical Kingbird was photographed on the 15th at West County Wastewater District Plant, CC (WB). The season’s 1st Bank Swallow showed up on Mar. 28 over Lake Merced (DA). On Mar. 11, a singing pair of Canyon Wrens suggested territorial activity at Diablo Foothills/Castle Rock in Walnut Creek, CC (JCS). Townsend’s Solitaires were on the move Mar. 4 along the Fish Trail in Henry Coe SP, SCL (CL), and on the 20th at Skylawn Memorial Park, SM (RT). The elusive Gray Catbird at the SF Botanical Gardens in GGP, SF, was refound on the 7th (DA). A Sage Thrasher lingered through the 13th at Contra Loma RP, CC (mob). Black-and-white Warblers continued at SF Botanical Gardens in GGP (mob) and in an SF backyard (JC). Likewise, the S. Lake Merced Northern Waterthrush lingered through the 6th (BF). The Alemany Farm (SF) Clay-colored Sparrow remained in residence through at least the 12th (RB). Beginning Mar. 20, a drab female Lark Bunting set up camp at the end of Marsh Road, SCL (RF; mob). Swamp Sparrows were detected Mar. 1 along Stevens Cr. Trail, SCL (mob), and on the 3rd at Las Gallinas Valley Sanitary District (RDG, ME). A continuing Orchard Oriole was last reported at the Community Garden on Potrero Hill, SF, on the 1st (DA). Beginning Mar. 18, a male Baltimore Oriole returned to Vasona Lake CP, SCL (KB; JP). A Lawrence’s Goldfinch wandered over Battery Godfrey on the 15th (PS). February finally brought much-needed rain—enough to wet the ground and turn the hills green but not enough to start filling reservoirs. Nevertheless, birds and birders welcomed the wet relief. A Red-necked Grebe made an inland foray to the Huichica Cr. Unit of the NAP-SON Marshes Wildlife Area, NAP, on Feb. 1 (TBe, MS). Northern Fulmars were regular along the SF and SM coasts, with a high count of 65 on Feb. 20 at Pigeon Pt. Lighthouse, SM (RT). The same seawatch tallied 3 Pink-footed, 2 Short-tailed, and 9 Black-vented Shearwaters. On the 7th, a Brown Booby was noted flying north past the Agate Beach parking lot in Bolinas, MRN (MD). Eurasian Green-winged Teal were reported Feb. 14–16 at Steven’s Cr., SCL (CL; BAS), and on the 20th at Hudeman Slough Wetlands, SON (MB). Tufted Ducks remained at their preferred wintering spots at Stafford L. in Novato, MRN (SK; mob); at the north arm of L. Hennessey, NAP (AM); and at L. Merritt in Oakland, ALA (oob). On the 15th, a male White-winged Scoter explored the Bay as far south as Salt Pond A7, SCL (SR). A Black Scoter came bayside Feb. 4–19 to join thousands of gulls and ducks at the Richardson Bay herring run in MRN (WL; KW, oob). Black Rails began calling this month, with a high count of 8-plus vocalizing Feb. 15–17 along Alviso Slough, SCL, a locale where they were unknown prior to 2013 (SR; BB). Other sites to hear Black Rail choruses included Las Gallinas Valley Sanitary District, MRN (JC); Martinez RS, CC (ST); Shollenberger Park in Petaluma, SON (RoS); and Bahia marsh in Novato, MRN (ML). A Wandering Tattler wandered to a small rocky island at Pt. Benicia, SOL, on Feb. 7, whereas the Fort Mason Wandering Tattlers stuck close to the abandoned pier all month (mob). Up to 5 Red Phalaropes were observed Feb. 19 and 25 from the Great Highway, SF, as they flew north (DM; PSa). A massive herring run at Paradise Beach CP, MRN, lured in a 1st cycle Lesser Black-backed Gull (Larus fuscus) on Feb. 1 (ST; PP). Another Lesser Black-backed Gull was discovered on the 13th in the gull flock that works the landfill at Hwy 113 and Hay Rd., SOL (JMo, DS). The Ferry Pt., CC, herring run on Feb. 4–6 attracted a couple of Slaty-backed Gulls (Larus schistisagus) (ST; mob). At least one was an adult that was identifiable as the same bird that has turned up at herring runs around the bay since 2011. To the north on Feb. 7, a Slaty-backed Gull joined the gull flock at Hwy 113 and Hay Rd., SOL (RM). On the 11th, another adult Slaty-backed visited the gull roost at the Pilarcitos Cr. mouth in Half Moon Bay, SM (MDF, AJ). Ancient Murrelets were spotted sporadically throughout the month from the Great Highway, SF (DM, PSa); Bodega Head, SON (SC); and Pigeon Pt. Lighthouse, SM (MDF, CH). A Lewis’s Woodpecker remained a local celebrity at Crane Cr. RP, SON, throughout the month (mob). Likewise, a Yellow-bellied Sapsucker continued at Ed Levin CP, SCL, through at least the 12th (mob). Red-naped Sapsuckers were reported Feb. 4–24 at Ulistac Natural Area, SCL (JP, oob; BR); Feb. 13–15 at Gazos Cr. and Cloverdale Rds., SM (MDF,CH; mob); and Feb. 16 from a yard along Zimpher Cr. in Sebastopol, SON (RiS). A wayward Pileated Woodpecker was heard and then seen Feb. 23 atop a Monterey pine along Donna Maria Way in Orinda, CC (RW). An overwintering Tropical Kingbird continued all month at Heather Farms Park in Walnut Cr., CC (mob), while the S. L. Merced (SF) Tropical Kingbird was last reported on the 2nd (DA). An unseasonal Cassin’s Vireo was located Feb. 14 in Annadel Park, SON (MH). The number of potential Oak Titmouse sites in SF doubled to 2 on Feb. 21 with the discovery of a titmouse at the Randall Museum in Corona Heights (BF, DM). A locally rare Canyon Wren explored the rocks above the Ranger House at Mission Peak RP, ALA, on Feb. 19 (DD). A Mountain Bluebird flock along Robinson Rd., SOL, was estimated to include 400 birds on Feb. 13 (JMo, DS). The Patterson Pass Rd. (ALA) comprised only 2 individuals on the 25th (JMi). A solitary Townsend’s Solitaire was located in juniper habitat along Mt. Olympia Rd. in Mt. Diablo SP, CC, on Feb. 17 (BT, JC, RF; oob). 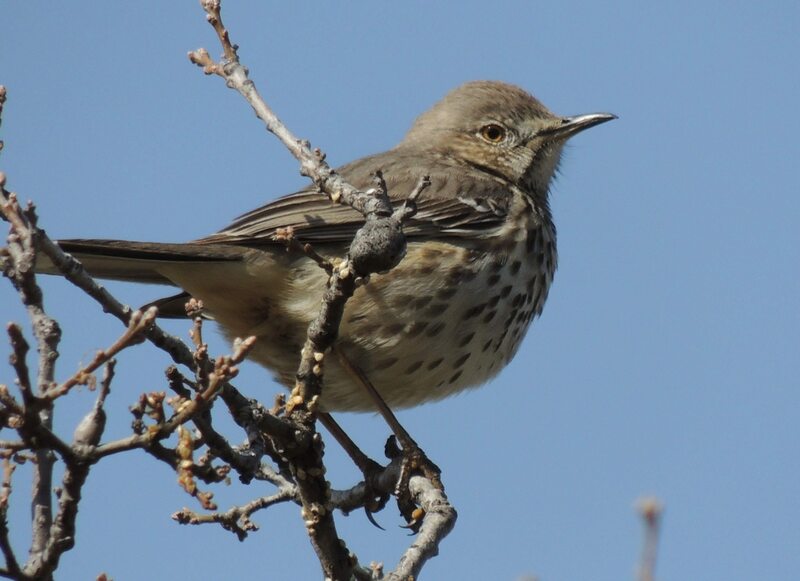 A Sage Thrasher turned up in unlikely grassland habitat in L. Del Valle RP, ALA, on Feb 15–22 (TBr; mob). On the 23rd, a 2nd Sage Thrasher was found running around on the ground at Contra Loma RP, CC (CW, TW; PSc, NS). In the vagrant warbler department, the Painted Redstart remained in the Elmwood neighborhood of Berkeley, ALA (mob); Black-and-white Warblers continued at SF Botanical Gardens in GGP (mob) and in an SF backyard (JC); and a Hermit Warbler overwintered at Greystone Park in Almaden Valley, SCL, Feb. 4–27 (BB; mob). A Summer Tanager was tentatively ID’d Feb. 16 along Stevens Cr. from Crittenden Lane, SCL (BB). The Alemany Farm (SF) Clay-colored Sparrow remained in residence through at least the 10th (mob). A Brewer’s Sparrow joined a Zonotrichia sparrow flock Feb. 18–22 at Shollenberger Park in Petaluma, SON (RoS; mob). An unseasonal Grasshopper Sparrow was located Feb. 20 near Hudeman Slough Wetlands, SON (MB). A Swamp Sparrow continued all month at Lafayette Regional Recreation Area, CC (KM), and new individuals were located Feb. 23–26 at Spring L. Park, SON (RoS; RR), and on the 28th along Stevens Cr., SCL (CL). The Bolinas (MRN) Harris’s Sparrow was last reported Feb. 2 (mob). Abbreviations for Observers: AJ, Alvaro Jaramillo; AM, Alex Merritt; BAS, Bilal Al Shahwany; BB, Bill Bousman; BF, Brian Fitch; BR, Bob Reiling; BT, Brian Turner; CH, Chris Hayward; CL, Caroline Lambert; CW, Chris Wills; DA, David Assmann; DD, Davor Desancic; DM, Dominik Mosur; DS, Dan Singer; JC, Josiah Clark; JL, John Luther; JMi, Jeff MIller; JMo, Joe Morlan; JP, Janna Pauser; JR, Jennifer Rycenga; KM, Kai Mills; KW, Kerry Wilcox; LB, Leonie Batkin; MB, Murray Berner; MD, Mark Dettling; MDF, Malia DeFelice ; MH, Moss Henry; ML, Margareta Luff; MS, Mike Stanley; NS, Nancy Schorr; PP, Peter Pyle; PSa, Paul Saraceni; PSc, Paul Schorr; RF, Rob Furrow; RiS, Richard Stradford; RM, Roger Muskat; RoS, Ron Storey; RR, Ruth Rudesill; RT, Ron Thorn; RW, Ray Witbeck; SC, Scott Carey; SK, Susan Kelly; SR, Steve Rottenborn; ST, Steve Tucker; TBe, Terry Berger; TBr, Tony Brake; TW, Teri Wills; WL, William Legge. January was a time of starting year lists, chasing continuing CBC rarities, visiting herring runs to pick through the gulls hordes, and most of all staring at an unforgiving blue sky as California’s drought turned serious. Governor Brown declared a state of emergency, 17 rural communities faced the danger of running out of water, and the State Water Project announced water delivery cut-offs affecting 25 million residents and about 750,000 acres of farmland. Birders watch with trepidation to see how our feathered friends will fare. Three Brown Boobies were reported in the Bay Area last month. Unfortunately, the 1st one was a dead bird, discovered Jan. 2 in a construction yard for the Bay Bridge along Burma Rd. in Oakland, ALA (fide BR). Among the living, an immature booby was spotted from Moss Beach, SM, on the 17th (RTh), and a southbound female was seen from the Great Highway, SF, on the 30th (BF). A Cattle Egret lingered through Jan. 7 at the Pleasanton Sports and Recreation Park, ALA (mob). The Trumpeter Swan (Cygnus buccinator) flock that made a splash at Lagoon Valley L. in Dec. relocated to McCoy Pond at Airbase Parkway, SOL, where they were last reported on the 4th (MPe; DDS). Male Tufted Ducks continued at L. Merritt in Oakland, ALA (mob), and at Abbott’s Lagoon, PRNS, MRN (MDe), and a 3rd male displayed his shaggy crest at Edgerly Island Pond 8, NAP, Jan. 13–17 (DMo; MDo, oob). A Harlan’s Red-tailed Hawk relocated from Alaska to the Bird Walk Coastal Access Trail at Bodega Bay, SON, Jan. 16–20 (LH; DBa). Rough-legged Hawks remained regular at several N. Bay coastal locations (mob) and along Midway Rd. in eastern ALA (MPa, ZB). In the S. Bay, a female Rough-legged Hawk was spotted Jan. 8 along San Felipe L., SCL (DS). A Pacific Golden-Plover greeted the New Year at Bolero Court Pond, Novato, MRN (DE). A 2nd Golden-Plover remained all month at Shollenberger Park in Petaluma, SON (LH). On the 28th, birders reported a possible Wilson’s Plover (Charadrius wilsonia) at Miller-Knox RP in Pt. Richmond, CC , where it was associating with a Semipalmated Plover and several peeps on the mudflat south of the pond (CM, TB, DBe, TH; fide MS). Unfortunately, word was slow to get out, and the bird was not relocated. A pair of Black Oystercatchers was a rare find for SOL, discovered Jan. 18 at the south end of First Street in Benicia (JL). Up to 4 overwintering Wandering Tattlers stuck to the abandoned pier at Fort Mason, SF (DA). On the 31st, a Rock Sandpiper flew in to the Pigeon Pt. Lighthouse rocks, SM, in the company of 11 Surfbirds and 3 Black Turnstones (RTh). 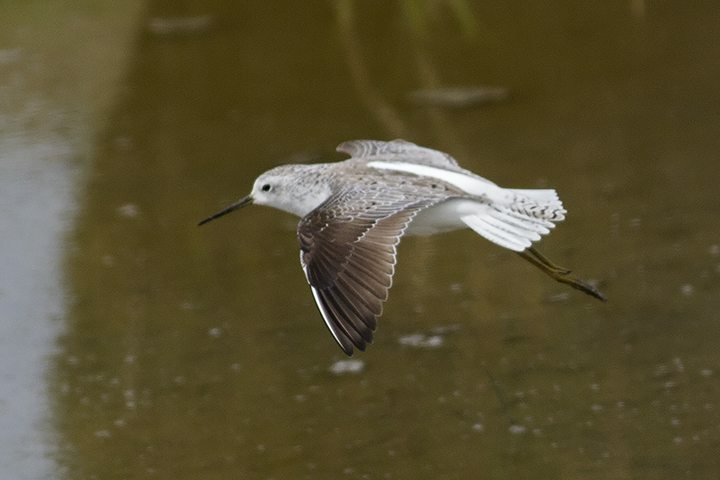 In SON, the Hudeman Slough Stilt Sandpiper was last reported on Jan. 10 (mob). January herring runs attracted 1,000s of gulls, including at least 2 adult Slaty-backed Gulls (Larus schistisagus) and multiple candidate Kumlien’s Iceland Gulls (Larus glaucoides). The 1st Slaty-backed report came Jan. 7 from Paradise Beach CP in Tiburon, MRN (NA), followed by 2 adults on the 10th at the MRN Rod & Gun Club (TE; DS, JCl, NA) and another singleton on the 31st back at Paradise Beach (TE, DS, NA, JCl). Elsewhere, a challenging 3rd cycle bird was picked out of the gull flock at the Pilarcitos Cr. mouth at Venice Beach in Half Moon Bay, SM, on Jan. 9 (AJ), and an adult Slaty-backed joined the Waste Management flock at Oyster Bay RS, ALA, on the 14th (BR). A solo Ancient Murrelet was spotted Jan. 4 from Bodega Head, SON (PC), and single birds were reported twice from the Great Highway, SF, first on the 18th and again on the 25th (PS, HC, DMo). A Tufted Puffin explored the coast as far south as Pigeon Pt. Lighthouse on the 19th (GH). 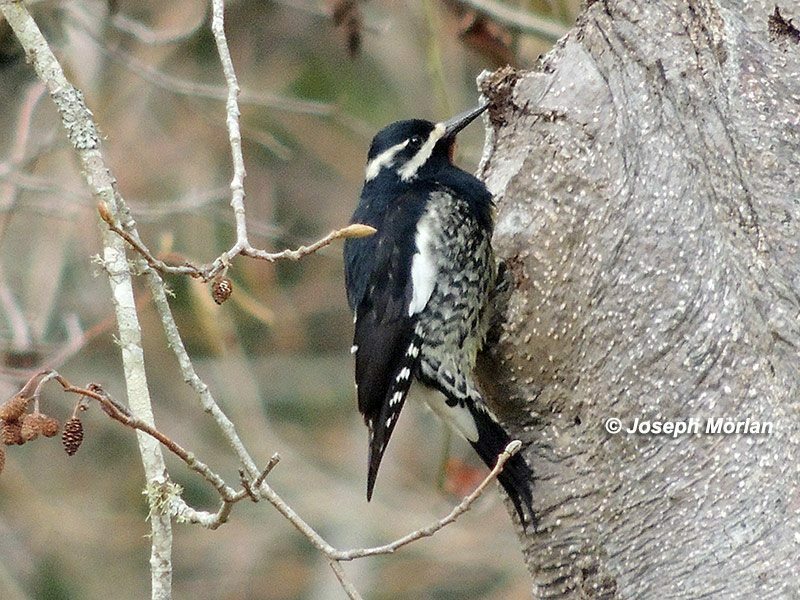 For the 2nd time in 2 months, SM harbored a male Williamson’s Sapsucker, this one located Jan. 4 at Camp Butano Cr. during the Año Nuevo CBC (MHe, BM, SSt, JCa; mob). The bird was widely reported until the 14th, when access to this private property location was restricted. Yellow-bellied Sapsuckers continued at Don Castro Regional Recreation Area, ALA (mob); at Ed Levin CP, SCL (mob); along La Honda Rd., SM (CH, MDF); and on Calaveras Rd., SCL (JCo). Red-naped Sapsuckers were reported from Joslin Lane in Vacaville, SOL (FO); Calaveras Rd., SCL (JCo); and San Pedro Valley Park in Pacifica, SM (RTr, fide JMo; mob); and at the SCL Valley Water District (JP; KB). The long-staying Eastern Phoebe remained along Stage Rd. near Pescadero, SM, through the 13th (ME; oob). Tropical Kingbirds continued at Martin Luther King Jr. RS in Oakland, ALA (DH; mob); S. L. Merced, SF (DMu, JMu); and Colma Cr. and SamTrans Marsh in S. SF, SM (RTh, LB; mob). Yet another Tropical Kingbird was located Jan. 24–31 at Heather Farms Park in Walnut Cr., CC (fide HH; TF, BHo). A juvenile Northern Shrike lured birders to the Huichica Cr. unit of the NAP-SON marsh, NAP, beginning Jan. 7 (MS; mob). A locally rare Oak Titmouse remained at Lobos Dunes in the Presidio, SF, through the 20th (mob). Patterson Pass Rd., ALA, remained a reliable spot to find up to 15 Mountain Bluebirds (mob). A pair of Townsend’s Solitaires rewarded a Jan. 1 visit to Castle Rock SP, SCL (AK). At the SF Botanical Gardens in GGP, a Gray Catbird kept skulking in the Andean Cloud Forest through the 21st (mob). In the vagrant warbler department, the Painted Redstart remained in the Elmwood neighborhood of Berkeley, ALA (mob); Black-and-white Warblers continued at SF Botanical Gardens in GGP and at the Half Moon Bay WTP (mob); and Northern Waterthrushes continued at S. L. Merced (PS, HC) and at Diekmann’s Bay Store in Bodega Bay (mob). Alemany Farm in Bernal Heights, SF, remained host to a Clay-colored Sparrow through Jan. 17 (mob). A Vesper Sparrow joined a Savannah Sparrow flock on Jan. 6 along Canada Rd. south of Edgewood Rd. in SM (SSm). On the 11th, another Vesper Sparrow found another Savannah flock at the Sierra Rd. summit, SCL (BB). The Bolinas, MRN, Harris’s Sparrow continued at Brighton and Park through Jan. 26 (mob). A Lapland Longspur joined the pipit flock at Bedwell Bayfront Park in Menlo Park, SM, Jan. 9–11 (RF; GM). Diekmann’s other celebrity, the Orchard Oriole, stuck around through the 17th. Abbreviations for Observers: AG, Ann Griffith; AJ, Alvaro Jaramillo; AK, Anna Krieger; BB, Bill Bousman; BF, Brian Fitch; BHe, Burr Heneman; BHo, Barney Howard; BM, Brooke Miller; BR, Bob Richmond; BT, Brian Turner; CD, Cédric Duhalde; CH, Chris Hayward; CL, Caroline Lambert; CM, Cindy Margulis; DA, David Assmann; DBa, Dave Barry; DBe, Diane Bennett; DDS, David DeSante; DE, Daniel Edelstein; DeW, Denise Wight; DF, Dea Freid; DH, Derek Heins; DK, Don Kirker; DMo, Dominik Mosur; DMu, Dan Murphy; DP, Donna Pomeroy; DS, Dan Singer; DS, Debi Shearwater; DWe, Dave Weber; DWi, David Wiechers; EC, Everett Clark; FO, Frances Oliver; GH, Garth Harwood; GM, Ginny Marshall; HC, Hugh Cotter; HH, Hugh Harvey; JCa, Justine Carson; JCh, Jim Chiropolos; JCl, Josiah Clark; JCo, Jack Cole; JH, Jack Hayden; JL, John Luther; JMo, Joe Morlan; JMu, Joan Murphy; JP, Janna Pauser; JS, Judy Spitler; KB, Karen Burnson; KF, Kathy Francone; LB, Leonie Batkin; LF, Leslie Flint; LH, Lisa Hug; LL, Laura Look; MDe, Mark Dettling; MDF, Malia DeFelice; MDo, Matthew Dodder; ME, Mark Eaton; MHe, Melissa Hero; MHo, Marcel Holyoak; MPa, Michael Park; MPe, Michael Perrone; MS, Maury Stern; NA, Noah Arthur; PC, Peter Colasanti; PD, Pete Dunten; PS, Paul Saraceni; RF, Rich Ferrick; RH, Roger Harshaw; ROD, Rob O’Donnell; RR, Ruth Rudesill; RTh, Ron Thorn; RTr, Ray Trabucco; SF, Stephanie Floyd; SMN, Seth McNaught; SR, Steve Rottenborn; SSm, Scott Smithson; SSt, Susan Stratton; TB, Tom Bennett; TC, Terry Colborn; TE, Todd Easterla; TF, Tracy Farrington; TH, Travis Hails; WL, William Legge; ZB, Zach Baer; ZS, Zack Stender. Abbreviations for Counties and Others: ALA, Alameda; CBC, Christmas Bird Count; CC, Contra Costa; CP, County Park; Cr., Creek; Cyn., Canyon; GGP, Golden Gate Park; L., Lake; MRN, Marin; Mt., Mount; N., North; NAP, Napa; NWR, National Wildlife Refuge; OSP, Open Space Preserve; PRNS, Pt Reyes National Seashore; Pt., Point; Rd., Road; Res., Reservoir; RP, Regional Park; RS, Regional Shoreline; S., South; SB, State Beach; SCL, Santa Clara; SF, San Francisco; SFBBO, SF Bay Bird Observatory; SM, San Mateo; SOL, Solano; SON, Sonoma; SP, State Park; SR, State Reserve; WPCP, Water Pollution Control Plant; WTP, Water Treatment Plant.